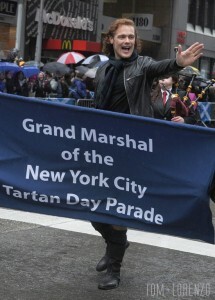 Sam Heughan, Grand Marshal of the 2016 New York Tartan Day Parade has been named Barbour’s first Global Brand Ambassador of the British clothing company. Heughan, who stars as Jamie Fraser in the mega hit drama “Outlander” , will develop his own capsule collection for Barbour, made with the brand’s signature tartans, which are based on the Ayrshire District Tartan from where the Barbour family originated in the 13th century. 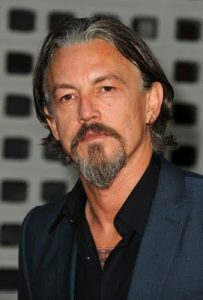 “I am delighted to be working with Barbour and feel very privileged that they have chosen me to be their first Global Brand Ambassador,” he said in a statement. 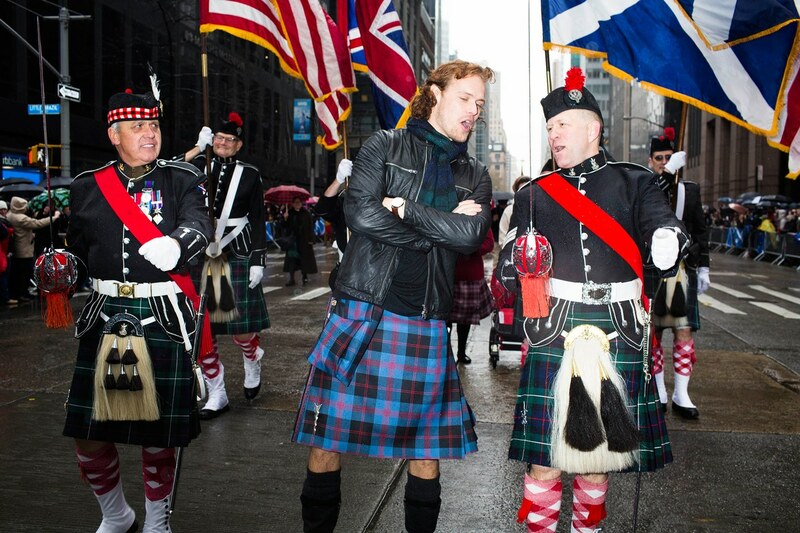 This entry was posted in News, Scotland-Tartan Week and tagged American Scottish Foundation, Barbour, New York Tartan Day Parade, nyctartanweek.org, Sam Heughan on July 15, 2016 by Camilla Hellman. 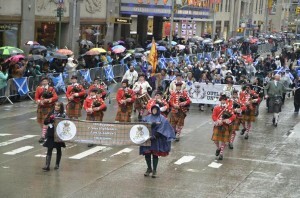 In 1998, April 6th was declared National Tartan Day. 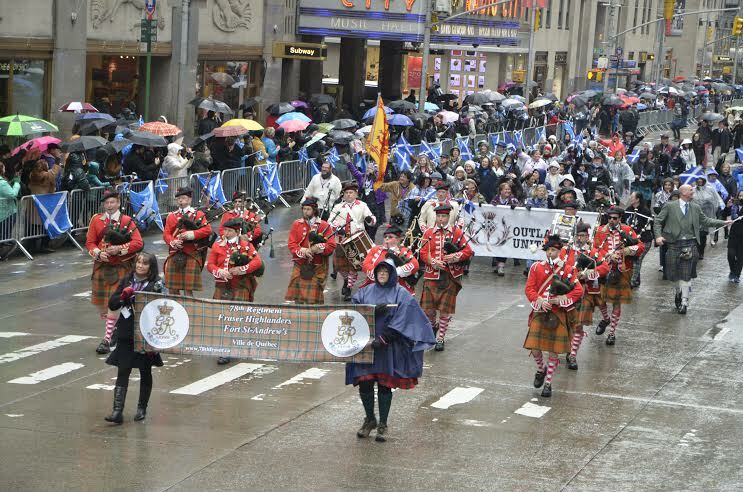 Since then celebrations of scottish heritage and pride have taken place throughout the United States, and nowhere more than New York who top off a week long celebration of events throughout the City, with the annual New York Tartan Day Parade. 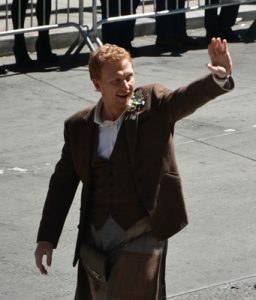 This years celebrations took on an added dimension as the hugely popular series Outlander, premiered their second season on the evening of the Parade – and the chosen Grand Marshal for the Parade was non other than the shows leading actor, Sam Hueghan. 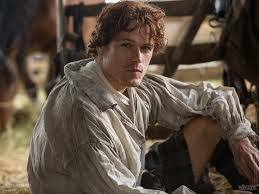 Heughan plays the dashing Highlander, Jamie Fraser in the series. Outlander fans were planning for months to come together in New York for the Parade and on hearing that Heughan was Grand Marshal the excitment grew. 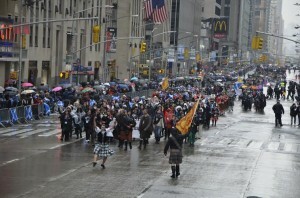 Many of the fans have visited Scotland or plan to, and so the Scotland’s national tourism agency VisitScotland wrapped a double decker bus for the Parade with the image of the Callanish Stones and messaging, encouraging New Yorkers to book their tickets to the land that inspired Outlander. 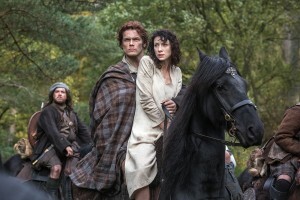 The series is filmed throughout Scotland, and already after the first series, premier locations featured in the series have seen an increase in visitors. Locations include Doune Castle, Culloden, Falkland and Culross, all of which have enjoyed a dramatic rise in visitor numbers. 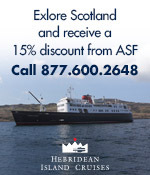 Malcolm Roughead, Chief Executive of VisitScotland, said: “Scotland Week is an opportunity for members of the Scottish tourism industry to meet with prospective visitors from the hugely important North American market, with events such as our Diaspora Breakfast always proving popular. Outlander has taken the world by storm and it is important that we capitalise on the continued success of a series in which Scotland really is the star. Outlander fans in New York during Scotland Week also enjoyed a special event taking place at NYC Beer Authority on the evening of April 8th. The Belhaven Brewery-sponsored gathering saw a number of Scottish businesses showcasing their Outlander-inspired wares, including jewellery makers Hamilton & Young, Walkers Shortbread, tour operator Mary’s Meanders and “Outlander Herbalist” Claire MacKay. Outlander is based on the best selling series of books by Diana Gabaldon. 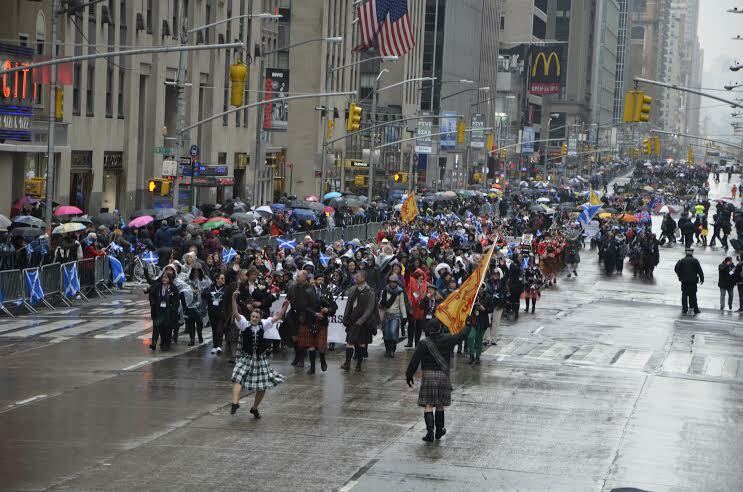 This entry was posted in Associate Events, Business, Uncategorized and tagged Hamilton & Young, Mary’s Meanders, New York City, New York Tartan Day Parade, Outlander, Outlander Herbalist, Sam Heughan, Tartan Week, VisitScotland, Walkers Shortbread on April 10, 2016 by Theresa Schilling. Actor Sam Heughan, who stars in the hit television series ‘Outlander,‘ shows off his Scottish roots with renditions of the classic Robert Burns’ songs, A Red, Red Rose and Ae Fond Kiss. A Red, Red Rose is a Scottish song which Burns is said to have picked up in the country. His writing of the lyrics immortalized the traditional song. The Scottish Bard gifted the lyrics to Scots singer Pietro Urbani, who created a melody for the verses. The song has been covered by artists throughout history. Recent renditions were performed by the likes of Jean Redpath, Pat Boone, and Carly Simon. Bob Dylan cites Burns’ 1794 song A Red, Red Rose, as the lyrics that have had the biggest effect on his life. Burns wrote Ae Fond Kiss for Mrs Agnes Maclehose, with whom he had a secret relationship. He penned the lyrics after their final meeting and sent it to Mrs McLehose before she departed Edinburgh for Jamaica to be with her estranged husband. The letter can be viewed at the National Library of Scotland, where it is a part of the Watson Autograph Collection of manuscripts. 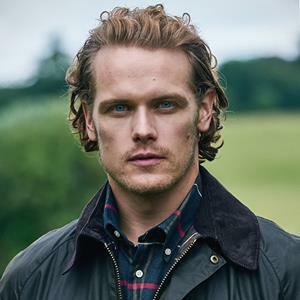 Sam Heughan’s renditions of Burns poems are part of a series released by the Scottish Government as part of a campaign to celebrate the Bard across the globe. January 25 is Burns Night in Scotland, as it is the poet’s date of birth. Celebrate Burns Night with these beautiful poetry readings. 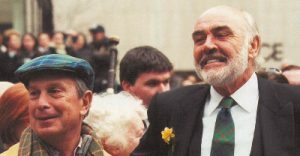 This entry was posted in Associate Events, News, Travel in Scotland, Uncategorized and tagged Agnes Maclehose, Burns Night, January 25, Lyrics, National Library of Scotland, Outlander, Poetry, Robert Burns, Sam Heughan on January 25, 2016 by Theresa Schilling.